The successor of the popular Wii U gaming console has been officially unveiled earlier this month and is expected to hit the market in March 2017. Codenamed as NX during development, the Nintendo Switch hybrid console is expected to launch featuring 4 GB of memory, as confirmed by Emily Rogers on Twitter. The next-gen Nintendo console has been in the rumor mill for a while, but most of its specs are not known even now, after its official announcement. What we know is that the tablet will be driven by a Tegra chip by NVIDIA and commercial availability of the device is scheduled to begin in March 2017. A Twitter message by Emily Rogers confirms that Nintendo Switch (known as NX during its development) will feature twice the memory of its predecessor, the Wii U. Her message reads the following: "I can confirm that Switch has 4GB of ram in RETAIL units. Not just the dev kits." While 4 GB is not that much these days, with more and more flagship handsets featuring 6 GB of memory, it will all depend on the optimization of the operating system. Additional details are expected to come via the official channels in mid-January. For now, we can only wait to see if the cartridge storage system returns next spring. 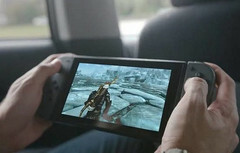 A 6.2-inch 720p multitouch display has been mentioned by rumors as well, while the SD-looking cartridges are expected to hold up to 16 GB each.